Vegans, milk haters, or anyone with an allergy to dairy can enjoy delicious ice-cream as much as their dairy-loving counterparts. We offer you the ultimate dairy-free ice-cream list in alphabetical order. Almond Dream non-dairy ice cream is surprisingly creamy and deliciously rich with its almond base. Available in quart and pint sizes they offer a wide variety of flavors. As a plant-based manufacturer, ingredients in their ice cream include filtered water, sea salt, natural flavors, sunflower, carob bean gum, guar gum, potato starch, cocoa, sunflower, expeller pressed oil, almonds and cane syrup. As a manufacturer of a variety of dairy-free products, their ice creams are among its top sellers. Alpro is the new UK based 100% organic ice cream in three flavours which are gluten and dairy free. It is soy based and nut free too. Currently listed as one of the UK’s top five dairy-free ice cream makers they offer vegan ice cream with less saturated fats and fewer sugars. The basis of Alpro is soluble gluco fibre and water and unlike most other dairy-free ice creams that use soy or coconut milk. This brand has kosher, non-GMO, fat-free, nut-free, gluten-free and dairy-free ice cream in one flavour, but you should look out for future flavours. Breyers is known in the full cream dairy ice cream isles, with a delectable range of flavorful dairy ice creams. Since expanding to dairy-free, which are made from almond milk we hope they expand into more flavours. The two flavours they currently provide are lactose-free, non-dairy, non-GMO and 100% organic vegan ice cream. Cado Ice Cream is only found in Northeast and Midwest United States but well worth looking out for when you are in those regions. Cado is different from all the rest with their avo based ice cream, with a motto that ice cream can grow on trees. It is dairy-free, non-GMO, organic ice cream made from avo and added organic cane sugar. The decadent dairy-free ice creams from DF Mavens are soy milk, almond and coconut milk based. All the ice creams here are vegan, from the ice cream bars to the pint-sized tubs. The ice creams carry the gluten-free and kosher stamps of approval. Since 1976 Double Rainbow manufactured premium ice cream as well as non-dairy soy-based ice cream, organic ice cream and other products. 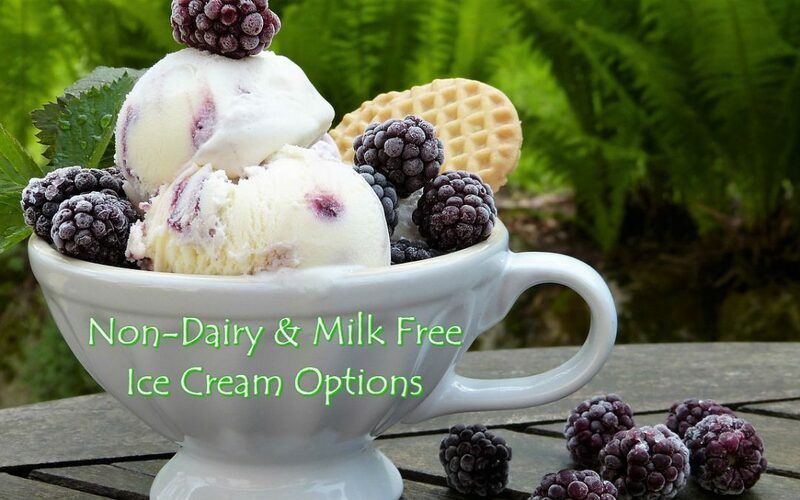 The dairy-free ice creams are certified organic, kosher, gluten and dairy-free. When you hear Haagen-Dazs, you are sure you should avoid as they are renowned for their creamiest, velvety ice creams and fine ingredients to give the dairy ice cream a new meaning. However, after recently expanding into non-dairy that delivers an equally delectable taste you will not miss anything. Halo Top offers a wide range of dairy-free, vegan ice creams that are soy free too. All Halo Top’s ice creams are coconut milk based, use no sugar, only organic stevia leaf extract and all-organic products. This delicious vegan ice cream is found throughout Colorado, Washington, Utah and California with hemp at its base, remaining 100% vegan and non-dairy ice cream in five flavors. The hemp is 100% organic and a complete digestible protein that contains more proteins than milk. This manufacturer offers organic, non-dairy ice cream with a coconut basis that is kosher, vegan, non-GMO, soy free and gluten free. Luna & Larry’s Organic Coconut Bliss vegan ice creams are all organic, soy free and gluten free too. This Is a family-owned manufacturer that uses coconut milk as a base. They believe in non-GMO, organic and vegan products. Rice Dream uses only organic brown rice in the manufacturing of their ice creams aside from organic by-products like agave syrup, guar gum, vanilla extract, tapioca starch, canola oil and rice dextrin. No synthetic or artificial ingredients are used, and non-GMO guaranteed. Snow Monkey’s dairy-free ice creams are gluten-free, nut-free and certified vegan and plant-based. Snow Monkey only offers two vegan ice creams, but well worth tasting. So delicious has a very wide range of vegan ice creams which are made either from almond milk, soy milk, cashew milk or coconut milk. Available in most grocery stores you get this ice cream brand in pint sizes, but also ice cream sandwiches, and vegan chocolate covered ice cream bars. Soy Dream uses only organic soybeans in its ice creams. Steve’s Ice Cream is one of the latest in vegan ice cream makers, yet many will choose Steve’sdairy free ice cream above many brands. Steve’s uses coconut milk as a base with other organic ingredients like guar gum, organic sunflower, sugar, vanilla, locust bean gum and pea protein. Van Leeuwen makes artisan ice cream but also a top vegan brand with fresh ingredients, cashew milk and coconut milk. It is immensely popular which saw a small food truck growing into an empire. Their current ten flavours cover many great ingredients. You do not need an ice cream maker to make delicious ice cream at home, including dairy-free ice creams. look at how a basic formula can give you magnificent tasting ice cream suitable for vegans or anyone allergic to dairy. flavoring like mint, cacao powder, cinnamon, vanilla, etc. 1/2 cup natural sweeteners like honey, coconut sugar, maple syrup, etc. add-ins of choice like chocolate chunks, cookies, seeds and nuts, fruit, etc. All you need to do is use a blender to combine these ingredients and place it in an air-tight container to freeze. Take note though that home-made ice creams freeze much firmer than store-bought products. Remove it ten minutes before serving after you froze it for four to six hours. Combine salt, maple syrup, coconut sugar and coconut milk (full fat) in a small pot and bring to a boil over low heat. Simmer for three minutes and add the vanilla extract after removal from heat. Cover and chill until cold. Make the ice cream using a food processor by bending slat, silken tofu, light coconut milk, and the chilled salted caramel. Add the guar gum and churn again. Freeze in an air-tight container until firm. Use a blender to combine mango, almond milk, cane sugar, and coconut milk. Add vanilla and orange liqueur and blend until smooth. Refrigerate until cold and freeze. These ingredients yield a quart. You add orange liqueur simply because homemade ice cream freezer differs to factory manufactured ice cream. It freezes hard while it will be softer as alcohol will not freeze.